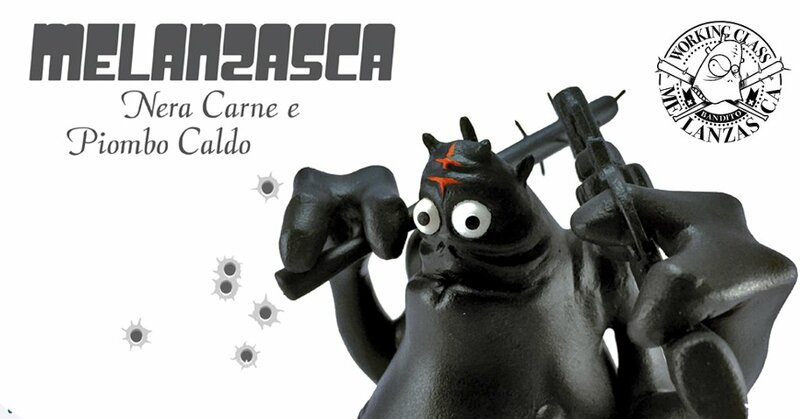 Melanzasca belongs to ‘a romantic working class underworld of people carrying guns and baseball bat Description: hungry for Twix snacks, bully-boy and ratty…but most of all a gentleman‘!!! It’s now available for purchase at Arttoygama web store HERE for $140 plus shipping! His artistic experience passed through comics, illustration, stencil art, silk-screen printing and toy art. He has lived in Berlin for a bit, and he has been lucky to show his artworks in Teheran (IRAN), Milan ( IT ) , Rome ( IT ), Schorndorf ( Germany ), Cardiff (UK) but where he the best for him it has been to meet Melanzasca, his creature, he, himself.